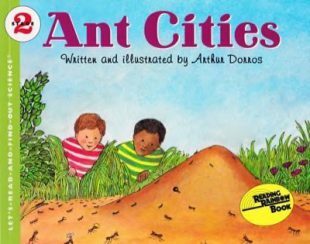 Ant Cities, Arthur Dorros, NY: HarperCollins, 1986. Draw an oversize likeness of an ant. Label all the body parts. Investigate the possibility of setting up an ant farm. Locate and read Two Bad Ants. Extend the story with additional adventures which might have occurred. Using the library’s catalog, research information about ants. Some possible sources: The Amazing World of Ants, Ants, Ants Are Fun, Hidden Messages, The Ants, Hey, Little Ant, The Ant Bully, Ants at Work: How an Insect Society is Organized, Journey to the Ants: A Story of Scientific Exploration. Check out a book or recording of “The Ants Go Marching” and have a group learn to sing it. Create other verses. Learn about the social organizations of other animals, for example: bees, other insects, or elephants (Elephant Families), and explore differences and similarities with ants.